Lot Detail - Dodge City Sheriff Bat Masterson, after Arresting Defendant, is Accused That He, "through gross neglect, willfully permitted him to escape … "
Dodge City Sheriff Bat Masterson, after Arresting Defendant, is Accused That He, "through gross neglect, willfully permitted him to escape … "
Three manuscript documents related to a lawsuit brought against Dodge City Sheriff Bat Masterson in 1879, each clerically written and signed, but none written or signed by Masterson. Minor flaws, good condition. 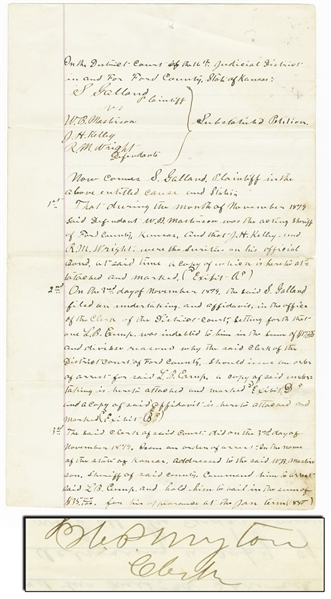 Manuscript Document Signed "Filed Dec 7" 81 / H.P. Myton / Clerk," 2p, 8.5" x 14", on two lined sheets conjoined at top, Ford County, Kansas. Myton was Clerk of Ford County from 1879-1881. In part, "In the District Court of the 16th Judicial District in and for Ford County, State of Kansas: S. Galland Plaintiff vs W.B. Masterson, J.H. Kelley, R.M. Wright Defendants} Substantiated Petition … The said clerk of said Court did on the 3rd day of November 1879 Issue an order of arrest - In the name of the state of Kansas. Addressed to the said W.B. Masterson, Sheriff of said County. Command him to arrest said L.B. Camp and hold him to bail in the sum of $35.00 for his appearance at the Jan term (1880) of said District Court … The said W.B. Masterson as Sheriff … executed the said order of arrest on the said 3rd day of Nov 1879, by arresting said L.B. Camp,. But contrary to Law and through gross neglect willfully permitted him to escape…"
... plus, Manuscript Document marked "Exhibit ( C )," 1p, 7.75" x 12.5", docketed on verso "Galland / vs / Camp / Order of Arrest." Contemporary transcript, in part, "In 9th Judicial Court to Jan. Term 1880. S. Galland Plaintiff S.B. Camp Defendant} Order of Arrest. State of Kansas Co. of Ford. The state of Kansas to W.B. Masterson Sheriff of said Co. You are hereby commanded to arrest S.B. Camp and hold him to bail in the sum of $35.00 for his appearance at the Jan. term (1880) of Dist. Court in and for said county on an affidavit filed by S. Galland in which he claims the sum of $17.50 … Witness my hand at Doge City said Co. this 3d day of Nov. 1879…" On verso, transcript of docket: "Recd this writ Nov 3d 1879 … Executed the same by arresting the within named S.B. Camp and have this day accepted bond for his appearance at the Jan Term … W.B. Masterson Sheriff." Three fees listed total 90¢. ... plus, Autograph Document Signed "H.P. Myton / Clerk," 1p, 8.5" x 11.25", dockets on verso, Ford County, Kansas, May 1880. Headed "Summons / United States of America / … You are hereby commanded to notify W.B. Masterson as Sheriff and R.M. Wright and Jas. N. Kelley his Bondsmen that they have been sued by S. Galland … and that unless they answer by the 18th day of June A.D. 1880 the petition of the said S. Galland against them … will be taken as true…"